Synonyms in other languages include Khmer tep (ទេព), tepda (ទេព្ដា), tevada (ទេវតា), or preah (ព្រះ), Myanmar language nat (နတ္), Tibetan lha, Mongolian tenger (тэнгэр), Chinese tiān rén (天人), Korean cheon, Japanese ten, Vietnamese thiên nhân, Thai thep (เทพ), thewa (เทวะ), thewada (เทวดา), etc. The concept of devas was adopted in Japan partly because of the similarity to the Shinto's concept of kami. Other words used in Buddhist texts to refer to similar supernatural beings are dēvatā (देवता; "deity") and dēvaputra (देवपुत्र; Pāli: devaputta; "son of god"). It is unclear what the distinction between these terms is. The term deva refers to a class of beings or a path of the six paths of the incarnation cycle. It includes some very different types of beings which can be ranked hierarchically according to the merits they have accumulated over life times. The lowest classes of these beings are closer in their nature to human beings than to the higher classes of deva. Devas can be degraded to humans or the beings in the three evil paths once they have consumed their merits. Buddhist devas aren't eternal. Their lives as devas began some time in the past when they died and were reborn. Buddhist devas are not immortal. They live for very long but finite periods of time, ranging from thousands to (at least) billions of years. When they pass away, they are reborn as some other sort of being, perhaps a different type of deva, perhaps a human or something beyond comprehension. Hindus hold some of these points to be true about the devas. The Hindu view is that the devas are in nature very much akin to the gods or angels of other religions. 1 2 "The Thirty-one Planes of Existence". www.accesstoinsight.org. Retrieved 2015-12-12. 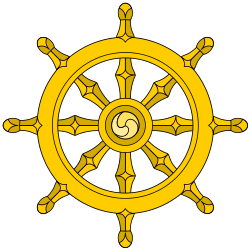 ↑ "31 planes of existence - Dhamma Wiki". www.dhammawiki.com. Retrieved 2015-12-12. ↑ "Buddhism and the God-idea". www.accesstoinsight.org. Retrieved 2015-12-12. ↑ "Wh180–1 — Gods & the Universe — Plain text". www.bps.lk. Retrieved 2015-12-12. ↑ "Teacher of the Devas". www.accesstoinsight.org. Retrieved 2015-12-12.